He is DNA’d and microchiped. 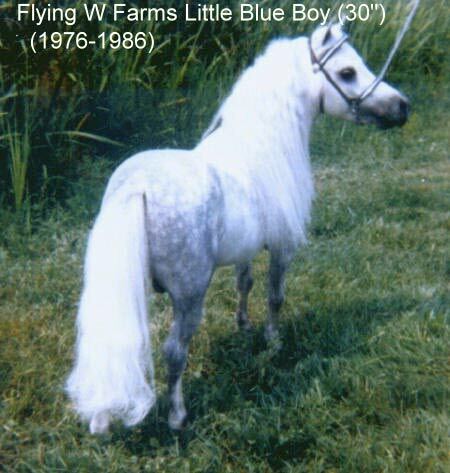 Legendary Flying W Farms Little Blue Boy. Contact us: flyingw@bright.net or phone 740-493-2401 (Fredericka's land line) please, no text messages. and we will send the video to you as an email attachment. For larger version of Dreams May Come's pedigree click HERE. This is a rare opportunity to buy a quadruple-bred grandson of the Legendary Flying W Farms Little Blue Boy. This three year old Stallion is 7/8 Blue Boy, (more than an own son of Blue Boy.). 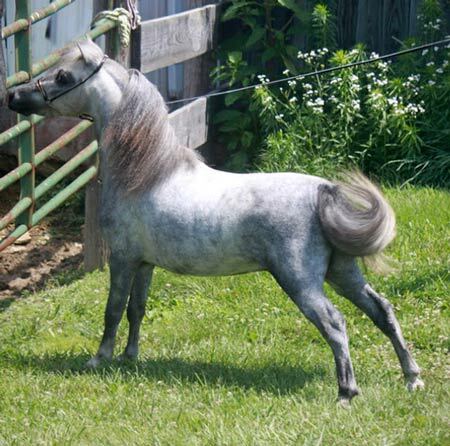 This stunning young stallion has multiple lines to Blue Boy coming from both sides. (see pedigrees of his sire and dam in photo section). “Dreams” has a gorgeous dished Arabian head with very fine muzzle; big eyes, elegant arching neck , short back and strong hindquarters; Excellent legs and feet, and a very full flowing mane and tail, very soft and silky. He looks like an exquisite little statue of a perfect Arabian horse. He is a beautiful mover, so airy and floating with great extension. He is perfect for showing; and as a sire will prove to be a great asset to some fortunate breeder. He has a very good disposition and is a people lover. Flying W Farms Little Blue Boy was a legend in his own time. 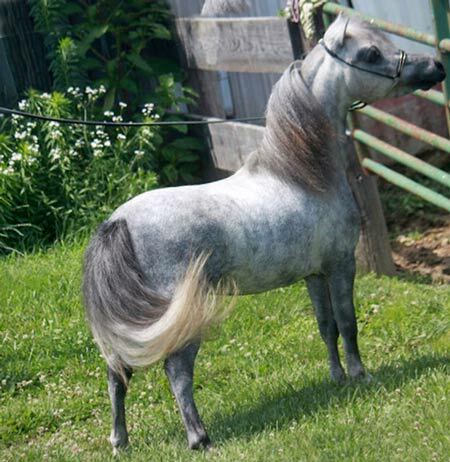 It has often been said, “Breed your mares to a double bred Blue Boy stallion and you will get champion foals. This stunning three year old stallion is ready to go out and win for you in the show ring, and give you many champion foals for years to come. You may be asking, why would we sell such an outstanding Blue Boy stallion? We had reserved him since birth as a replacement for his sire; Fortunately, his sire is still going strong. However, we also have a yearling and a weanling brother to Dreams. So we feel safe in letting him go. 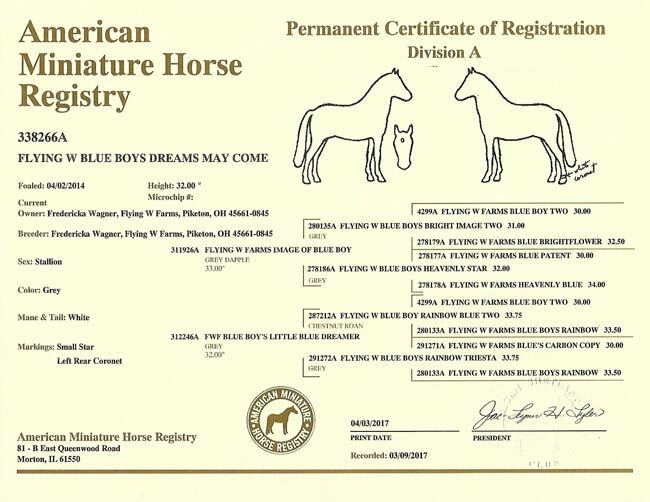 If you want a miniature with concentrated Blue Boy | blood, the only place you will find it is here at Flying W Farms. We began breeding double bred Blue Boys years ago, and now have triple and quadruple breds. This is a fantastic opportunity to buy a stallion that is truly“For those who want the very best. View his video, and photos and look at his amazing pedigree! Contact us: flyingw@bright.net or phone 740-493-2401 (Fredericka's land line). His price is reasonable, $4,000 or best offer with papers and full breeding rights. Or, $1,000 without his papers. Buyer may use him as a stallion but cannot register his foals without his papers. To a good home only. Checks are fine provided ample time is allowed (three weeks) for checks to clear bank prior to horse leaving our farm.